Obamacare Enrollment Triggers Drop In The Uninsured Rate : Shots - Health News The sizable jump in Americans with insurance, due in large part to the implementation of the federal health law, is unprecedented since the creation of Medicare and Medicaid 50 years ago. 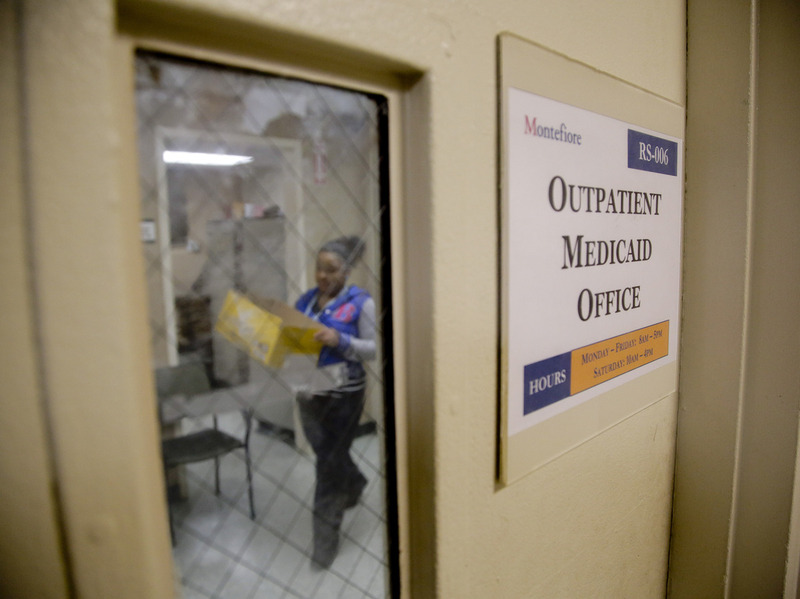 A Medicaid office employee works on reports at Montefiore Medical Center in New York in late 2014. New York expanded Medicaid eligibility under the Affordable Care Act and enrollment surged. The percentage of Americans without health insurance dropped by nearly three percentage points between 2013 and 2014, according the U.S. Census Bureau, from 13.3 to 10.4 percent. Put another way, 8.8 million more people were insured in 2014 than the year before. The annual study from Census is considered the definitive measure of health insurance, although a change in the way health insurance questions are asked make this year's report comparable to 2013 but not earlier years. Census officials, however, point out that a different annual survey that has asked health insurance questions consistently show this to be the biggest drop in the uninsured since at least 2008. Others say the sizable increase in Americans with insurance — due in large part to the implementation of the federal health law — is unprecedented since the creation of Medicare and Medicaid 50 years ago. "It's probably the biggest drop ever," said Paul Fronstin, director of health research at the Employee Benefit Research Institute, who has been studying the uninsured since 1993. Despite the gains, the Census study found that 33 million people are without insurance. While the gains in insurance coverage were widespread, they weren't equal in every category. Not surprisingly, among types of coverage, the biggest increases were in people covered by Medicaid (up 2 percentage points to 62 million people) and people buying their own health plans (up 3.2 percentage points to 14.6 million people). Expanding Medicaid and making private insurance easier to purchase by those without employer coverage were key focuses of the health law. But the largest single source of health insurance remains employers. That number held steady at around 55 percent. The uninsured rate dropped for every age, income and ethnic group and in every state, although, again, some gained more than others. Those at the lower end of the income scale were more likely to gain insurance than those with more resources. The uninsurance rate for households earning less than $25,000 per year dropped 4.3 percentage points. The rate for those with incomes between $25,000 and $50,000 dropped 5 points. The uninsurance rate for those earning more than $100,000 annually dropped too, but by less than a percentage point. Similarly, the uninsured rate for the white non-Hispanic population (the ethnicity most likely to have insurance) dropped by just over 2 percentage points, while the rates for blacks, Asian-Americans and Hispanics dropped by more than 4 percentage points each. Among states, Massachusetts (which began requiring most people to have insurance in 2006) had the lowest rate of people without coverage, at 3.3 percent, while Texas continued to lead the nation with the highest uninsured rate — 19.1 percent. States that expanded Medicaid, however, saw overall gains in insurance — not just Medicaid — that were larger than those that didn't. For example, people with incomes above poverty but less than four times that (most of whom aren't eligible for Medicaid) still saw an overall decline in uninsurance of 6.4 percentage points in states that expanded Medicaid, while states that didn't take that option saw that rate drop by only 4 percentage points.